" Phantom Space" (working title). 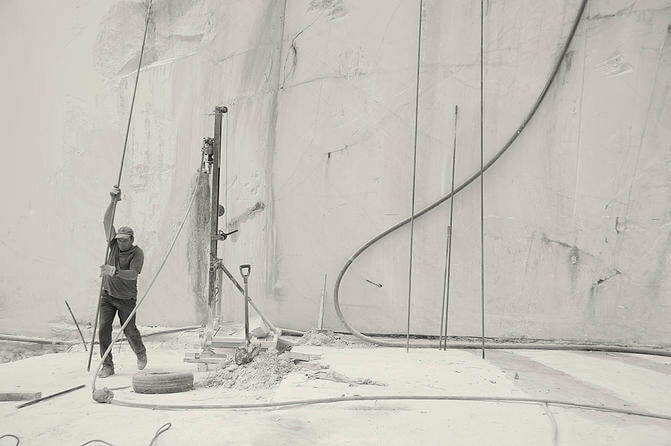 Exhibition with photos and videos by Robert Monaghan (Ireland), including a video showing Phyllis Akinyi (Denmark) performing in a marble quarry, with a soundscape by Miguel Noya (Venezuela). INATEL gallery of Palácio de Barrocal, Évora (6 June -12 August 2019). "Around 31" (working title). Exhibition with photos of 31 years-old women. A project by Katharina Fröschl-Rossboth (Austria). Performance by Phyllis Akinyi (Denmark). Patio of Palácio de Barrocal, Évora (6 June, 6.30pm). More info will follow soon. Sherry Wiggins (USA) and Luís Branco (Portugal) with photos related to water and drought in Alentejo. Probably in the Palácio de Barocal in Évora. thirty-five art workshops and music master classes (this activity stopped in 2011). Mercado pelo Tempo. Exhibition of ceramic and textile work by Yvonne Halfens (Holland). 25 August-15 October 2018. Fortress of Castelo de Evoramonte. With a partial extension in Herdade da Marmeleira (16 October - 10 January). I Am the Size of What I See. A live quadrophonic musical/multi-media performance based on the work of Fernando Pessoa during the years of World War I. Developed and performed by DOGON (a musical collaboration of Paul Godwin (USA) and Miguel Angel Noya (Venezuela), and multimedia projections by Ameera (A.E. Godwin, USA). 6 October, INATEL, Patio of Palácio de Barrocal, Rua Serpa Pinto 6, Évora. Exhibition with Gaëlle Pelachaud (France). Artist books, with specific emphasis on her study on storks. With contributions by Maria Sarmento (Portugal; poetry) And Matthew Manowsky (USA; sound installation). 19 April - 30 May 2018. Exhibition with Andrea Brasch (Denmark). Video, collages and Virtual Reality composition. 19 April - 30 May 2018. Exhibition with Kevin Morrow (USA). 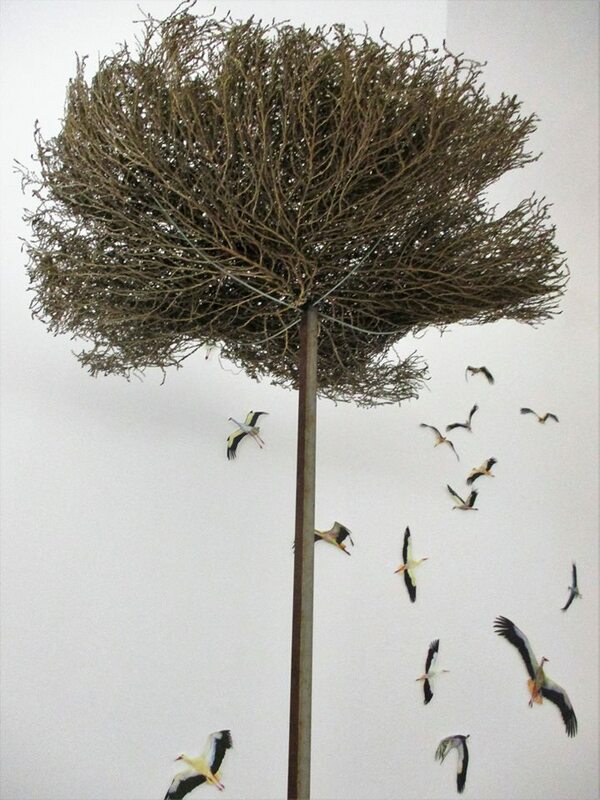 Sculptures and installations. Castelo de Evoramonte. 23 September until 4 November. Hosted by DRCAlen. De Longe e de Perto. Exhibition with Jacobien de Rooij (Holland). X-large sized drawings. Palácio dos Marqueses da Praia e Montforte, Estremoz. 25 March - 21 May 2017. 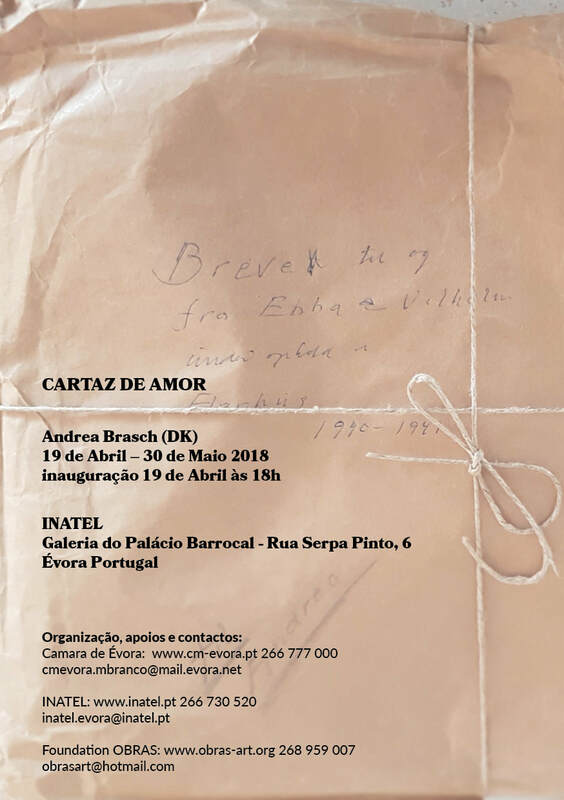 Hosted by the Municipal museum of Estremoz. Click for an impression of the exhibition and the opening. Exhibition with Ingrid Simons (Holland). Paintings and ceramics. Galeria Dom Diniz, Estremoz. 17 June - 27 August 2017. Hosted by the Municipal museum of Estremoz. Don´t Stop Wanting. 7 October 2016. Site specific happening by Ruby Fiedler and Peter Emptage (Australia) in the ruins of the watermill at Pego do Sino, starting with a musical walk from Monte da Marmeleira. Click for an impression. Som + Cor . Exhibition with Scott Sherk (soundscapes) and Pat Badt (lightscape). Castelo de Evoramonte. 12 August - 25 September. Click for an impression made by Michel Alvez. The Profit of Seville. Musical theater piece by Elena Cheah and Raphaëlle Oskar. Igreja de S Vicente, Évora. 30 August. See the trailer. Between departure and arrival. Exhibition with Monica Miranda. Palacio de Dom Manuel. 2-30 April. Uma Estrana no Alentejo / een vreemdeling in Alentejo (a stranger in Alentejo). Exhibition and a book with poems and installations by Gerry van der Linden and photos by Luis Branco. Public Library of Évora. Opening of the exhibition and preparation of the book: 28 April - 28 May. Book publisher: Caminho das palavras. O teatro de Passagem. Happening initiated by Bart Dorst (Holland). In the abandoned train station of Estremoz. 24 May 2016. With collaborations of Josef Kleindienst (Austria), Regan Halas (USA), Ingrid Simons (Holland), Kris Williamson (Malaysia) and Tim Pettit (USA). Click for an impression. Meadows, marble and more. Open Studio. 25 April 2016. with contributions of Janet Griffiths (UK), Aurélie Dubois (Canada), Diane Richey-Ward (USA), John Galan (USA), Elma van Haren (Holland), Ingrid Simons (Holland), Tim Petitt (USA), Regan Halas (USA) and Kris Williamson (Malaysia). Summer Works. Open Studio. 28 August 2016. With exhibitions, video presentations and small concerts. Participants: Catalina Ouyang (USA; video, marble sculptures and drawings), Gerry van der Linden (Holland; poetry), Yvonne Halfens (Holland; ceramics), Nico Huijbregts (Holland; painting, piano improvisations), Raphaelle Oskar (Croatia; acting), Elena Cheah (USA; cello and voice) , Saaya Hitomi (Japan; video installation) and Hannah Pass (USA; writings). Wired. Exhibition with Jonathan Roson. 11 August- 22 September 2015. Castle of Evoramonte. IT IS OK. Try out of a musical theatre production by Elena Cheah (USA) and Raphaelle Oskar (Croatia). 13 September. Herdade da Marmeleira, Evoramonte, Portugal. Parts and Pieces. 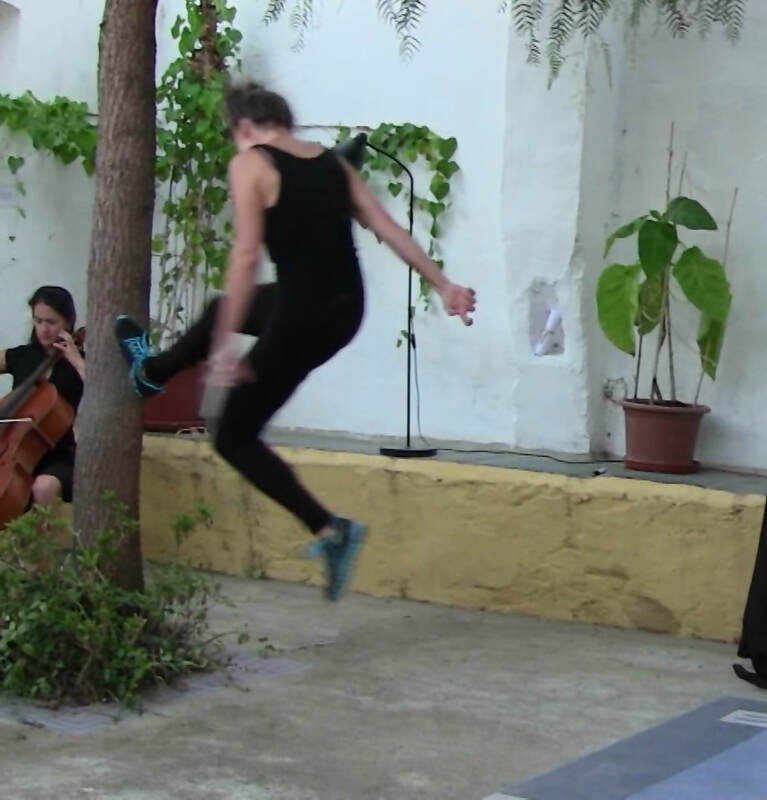 Performance by Paola Lobreiato (video, acting, music). 11 September 2015. Herdade da Marmeleira, Evoramonte, Portugal. O azul do Alentejo sob o meu olhar Exhibition with Ingrid Simons. May-10 August 2015. Museu do Artesanato e do Design, Evora. Pegasus. Exhibition with James Westwater. 18 June -10 August 2015. Castle of Evoramonte. A central element in the exhibition was an old moto, with “life-size” wings attached, that references the mythological flying horse of the title. Canções Silenciosas. Exhibition with Erdmute Blach. Palacio de D. Manuel. 4 April - 16 May 2015 (in collaboration with Câmara de Évora). Raios de Luz . Exhibition with Ingrid Simons. Municipal Museum of Estremoz. 3 May - 21 June 2015. Close proximity. Exhibition with Dasha Sitnikova (Russia). 23 September- 23 October 2014, Castle of Evoramonte. See page Dasha. Poong-gyung in Evoramonte. Dance performance by Barinamo. 23 September 2014, Castle of Evoramonte. See page Barinamo. N18 Evoramonte. Performance and installation. 27 September 2014, Herdade da Marmeleira. See page Barinamo. Aiando. A multimedia event (performance, sound, images) by Nuno Veiga (Portugal, living in London) and Melina Peña (Mexico, living in Barcelona). 22 August 2014. Castle of Evoramonte. Sete Filhas, Sete Irmãs. A duo exhibition with Sally Safford (painter; UK) and India Flint (textile artist, Ausatralia). Castelo de Évoramonte, 21 June – 18 August 2014. Dance perforamance by Marcio Pereira, on the occasion of the inauguration of Sete Filhas, Sete Irmãs: a duo exhibition with Sally Safford (painter; UK) and India Flint (textile artist, Australia). Castelo de Évoramonte, 21 June. Erva Dourada. Open Studio with eight artists. 25 May 2014. The Open Studio included: Wall works, OBRAMOOR, an exhibition with Nico Huybregts, and Alentejo Tree Cloud, an exhibition with Norlynne Coar. Qualia. An exhibition with Erika Dahlen (Sweden), Palacio de D. Manuel. 22 April – 18 May 2014 (in collaboration with Câmara de Évora). See her temporary page for more information. Solid Harvest. Exhibition and Open Studio with Jonathan Roson (Australia). 4, 5 May 2014. See his temporary page of more information. Cores Alentejanas-II: Open Studio and Exhibition. 15-26 March 2014, at Foundation OBRAS, Evoramonte. Works were shown (partly finished and partly in progress) that the artist made during her residencies in Portugal in 2013 and 2014. 29 September – 6 October 2013. Finding Pegasus. With James Westwater. An exhibition of paintings, found objects, and installation art. Foundation OBRAS, Evoramonte, Monte de Marmeleira. 1-30 August 2013: Helena Aikin (Spain). The labyrinth of lLaxas las Rodas. Installation in Jardim Público. Hosted by Camara de Évora. July 2013. Concerts tour in Holland. With Mauro Dilema (Italy; piano) and Lina Uinskyte (Lituania; violin). Concerts in Nijmegen (Heijendael), Hilversum (Jagthuis) and Zwolle (Cultuurschip Thor). 18 May- 16 June 2013. Jardim Secréto. Exhibition with Ingrid Simons. Castélo de Evoramonte. Hosted by Direcção Regional da Cultura de Alentejo. 18 May 2013. 4SAXUE. Saxophone concert. Castélo de Evoramonte. 7- 28 April 2013. Free water. Installation by Benten Clay Collecxtive. Jardim Público. Hosted by Camara de Évora. 23 March – 21 April 2013. Deambular… Floor mosaic by Annemie Bogaerts (Belgium). Castélo de Evoramonte. Hosted by Direcção Regional da Cultura de Alentejo. 23 March 2013: concert by Luis Pucarhino (voice and guitar). Castélo de Evoramonte. September, October 2012. Só os caminhos eram meus . With Ingrid Simons (Holland). Palacio de D. Manuel, Évora. August 2012. There will be no shepherds anymore. Video installation with Liam Garstang Casa da Zorra, in Évora. April, May 2012. Digging for Lightness. With Niek te Wierik. Paláçio de Dom Manuel, in Évora. May, June 2012. Now and Then. With Paul Kohl, Municipal Museum of Estremoz. May, June 2012. What we Carry. With Sandra Trujillo. Paláçio de Dom Manuel, in Évora. May, 2012. Homeland. By the artists collective “The Family”: Yvonne Halfens, Sibylla Weisweiler, José Grasso, Peter Bremer, Vincent van Delft and Nico Huijbregts. With text contributions of Miranda Train and Bram van Dam. Casa da Zorra, in Évora. May 2012. Homeland improvisations. piano concert by Nico Huijbregts. Casa da Zorra, in Évora. September 2011. Tyler Snazelle (Oregon, VS). It’s my nature. Harmonía, Évora. May 2011. Ellen Warfield (New York, USA). The Earth is Laughing at us. Harmonía, Évora. April 2011. Jacobien de Rooij and Erik Mattijssen (Holland). Estou só a ver. Igreja São Vicente, Évora. June 2010. Luc van der Velde (Belgium). Nostalgia. Igreja São Vicente, Évora. June 2010. Claire Watson (Australia). Tree of Life. Public art work in Jardim Publico, Évora. May 2010. Lim Shoo Wen (film maker, Singapore) screened some of her short films in the Public library in Évora. April 2010. Ingrid Simons (Painter; Holland). A Luz da Lua. Igreja São Vicente: Évora. September 2009. Cedendo à Terra. Visual arts exhibition with Birgitte Thorlacius (Denmark), Babette Werth (Germany), Olivia Bliss (Scotland), Christine Leathem (Northern Ireland), Karl Ciesluk (Canada), Frede Troelsen (Denmark), Leonor Venâncio (Portugal), Patricia Loucks (Canada) and Magda Giebels (Portugal). Herdade da Marmeleira, Evoramonte. June 2009. Escritas em Sede a Prata. 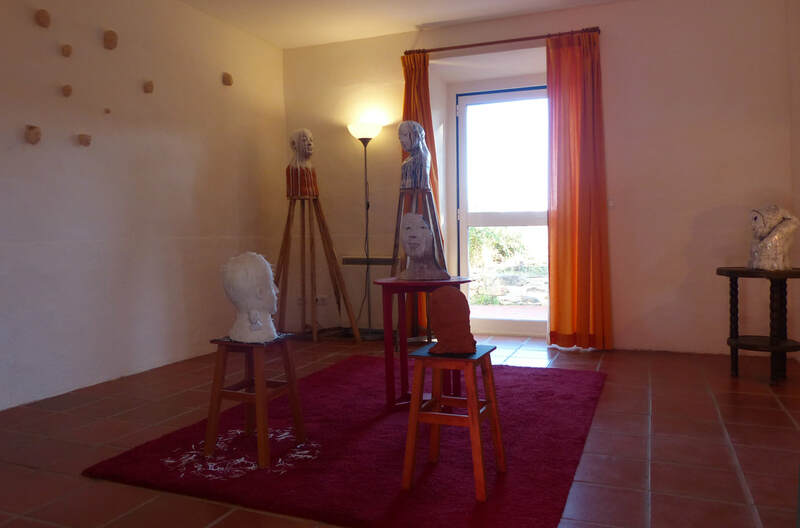 Exhibition by Patricia Loucks (Canada) in co-operation with Cláudia Branco (Portugal) and Miguel Tomás (Portugal) in Convento das Servas de Cristo, Borba. March - April 2009. Os Espaços do Tempo. Exhibition by René Coelho (Netherlands). Igreja S. vicente, Evora. Six ﻿﻿﻿publications﻿﻿﻿ with ISBN code have been published by OBRAS. Available are also brochures and leaflets on past exhibitions and open-ateliers, CDs with the concerts that concluded the polyphonic music workshops, and DVDs with dance and other performances. More visual information can also be found on the “foundation OBRAS” channel of YouTube.